For those of you who don't know me, you might not know that I am obsessed with drinking vessels -- may it be cups, mugs, or glassware. I eat (errr, drink?) it all up, and even though I don't drink much coffee, I do drink lots of tea, and mugs and teacups are needed to engage in such activities, no? As such, my kitchen cabinets are overflowing with my grand excess of ceramic drinkware. 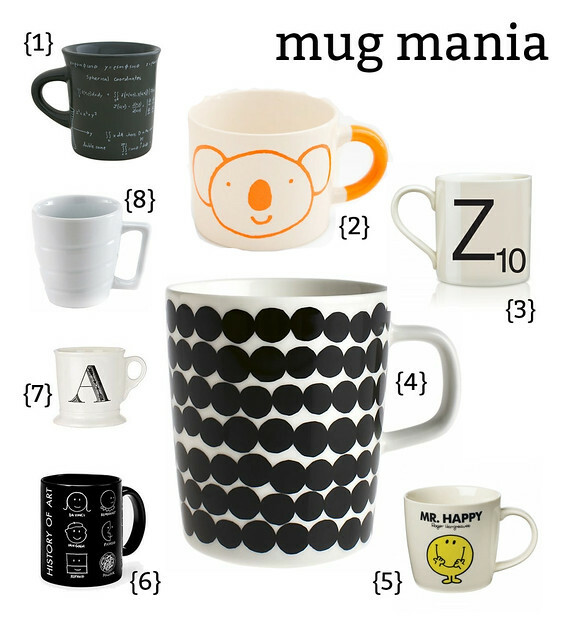 I own the first three (for my inner math geek and my everlasting love for koalas as well as for my penchant for word games like Scrabble -- a mug which I received as a gift from Dan), and the others are ones that are on my ever-growing wishlist. I've always had an appreciation for art, architecture, design, and typopgraphy, and also loved the Mr. Men book series growing up -- which all might explain my choices below.